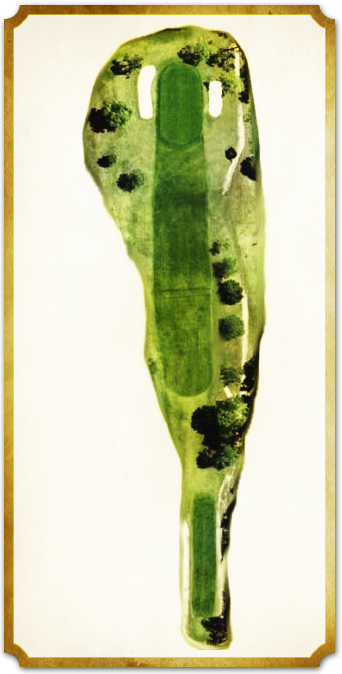 The longest par 3 on the course usually plays 1-2 clubs longer due to the prevailing headwind. The good news is that the green will accept a rolling shot, and even if making the green takes more club than you have in the bag, short of the open fronted green is the best place to chip from. Care must be taken to ensure a putt from the correct level of this double tiered crowned green, or getting down in two with the flat stick will challenge even the purest putting stroke. This hole was originally a par 4; you can see the remnant of the old tee box behind and to the right of the current tee. Many players, however, still consider 3 a birdie here.